Bad Diaries Salon was established mid-2017 with a call out from Jenny Ackland on Twitter – were there any writers who still had their old, bad teenage diaries, and would they be prepared to read them live? The response was overwhelming. Result: four salons were held in 2017, and Bad Diaries Salon is back with a Winter 2018 series kicking off in Port Fairy on 7 July. The Bad Diaries Salon is a series where published writers read from their early, terrible works. Cringe-worthy diaries, terrible novel drafts, teenage angst poetry, horrendous short stories or other juvenilia. 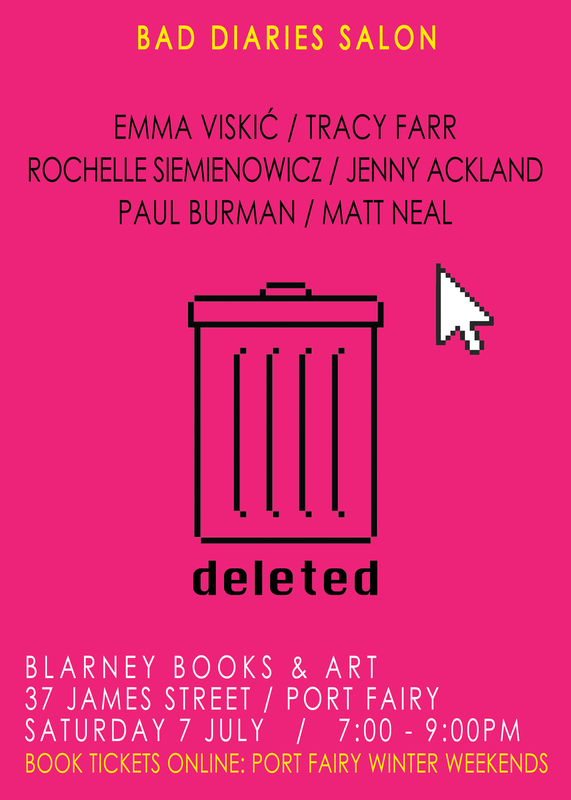 On Saturday 7 July, readers will read for ten minutes each to the theme of DELETED. Confirmed readers are Emma Viskic, Tracy Farr, Rochelle Siemienowicz, Paul Burman, Matt Neal and Jenny Ackland. This event is hosted by Port Fairy Community House and Blarney Books and Art for a weekend of literary events, as part of Winter Weekends Port Fairy.